Turn on the radio; make sure you have everything so you don’t have to go back in the house; stuff Gretel’s treat toy and get a treat that takes Chester and few seconds to chew; the dogs see this and run into their crates; throw the treats into the respective crates and run out the door so you are gone before they are done with them and look up. We put Chester and Gretel in crates when no one is home to keep them safe and keep me sane. I don’t like stressing about what they might be eating (ahem, Gretel) or peeing on (ahem, Chester) while we are gone. They both experience a bit of anxiety too when we are gone and the crates seem to help with that. The game is to distract them so we are out the door before they look up. A stuffed treat toy works perfectly for Gretel. Chester prefers his treats to be “free range” though. He is lazy and doesn’t want to work for them. I give Chester treats that take a little bit of chewing to get through to buy me “leaving” time. My favorite thing to give Chester are trachea rings. Animal trachea, or windpipe, is naturally high in glucosamine and chrondroitin which are good for joint health. Since Chester is a senior, that is really important to me. They are also high in protein and low in fat. 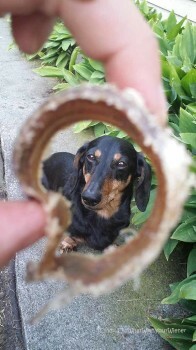 I have been giving Chester Windee Rings from Jones Natural Chews Co. (Jones Chews) that are made from beef trachea. Gretel’s treat toy gets stuffed with her “vitamin” treats – healthy coat, joint supplement, natural calming treat, etc – and “cap” them off with a few really tasty morsels. We vary the tasty morsels so she doesn’t get bored. 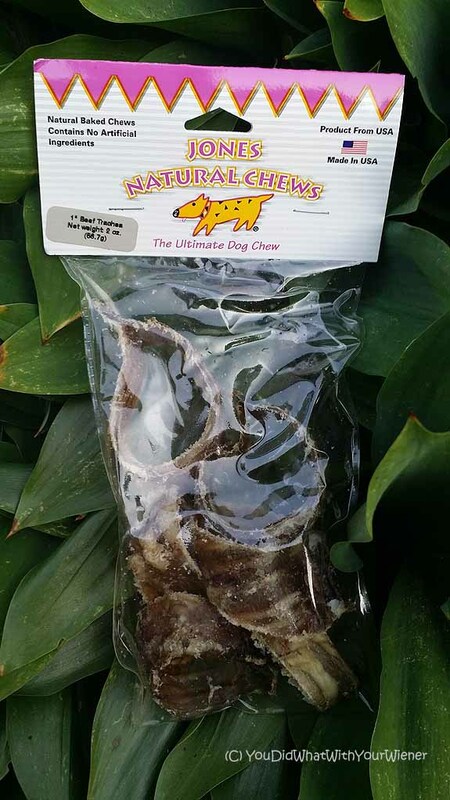 Lately we have been adding chunks of Lamb Lung Puffs from Jones Chews. I feel really SAFE feeding Chester and Gretel treats from Jones Chews because I know they are 100% natural and USA-sourced. I feel WARM AND FUZZY about giving then Jones Chews because I know I am supporting a small, independent Mom and Pop business. Disclaimer: This post is sponsored by Jone’s Natural Chews. I received Windees and Lamb Lung Puffs in exchange for my honest review. Here at YouDidWhatWithYourWeiner, free does not equal good so everything we say is really how we feel about the product. Jones Natural Chews is not responsible for the content of this article. The leaving routine is putting Animal Planet on the TV and giving Stella a treat and putting her into her kennel. Thanks for the chance! well, my dogs tend to “suss out” that I’m going somewhere and are NOT easily conned. Teddy, esp, KNOWS I am about to trick him, but, once “captured” he goes willingly into his crate. His pal, a little rat-terrier named JOJO has begun insisting on going into the crate with Teddy….too sweet. The thing is, I have three “go dogs” Teddy, Daisy and Jojo. They expect to ride along and will do anything to get out the door and wait for me by the car…talk about blackmail! This makes me feel totally rotten when they CAN’T go along! I eventually get everybody sorted but, I always add about 20 minutes to leaving so that crates can be populated and anybody who is getting picked on will be in a safe place…I have seven (you get into animal rescue, this happens) and, while they usually get along great, territorial disputes WILL break out, so, if I am not going to be at home, they need their safe spots. They LOVE LAMB PUFFS! Yes, my friend runs a rescue and just had a foster failure with a cat. I think she has something like 5 cats and 10 dogs now 🙂 Your routine sounds complicated but I bet you have it down pat now. Leaving routines become automatic after a while, right? My baby boy, Cooper (piebald dachshund) and his big sister, Chien (German Shepherd mix) know when mom is leaving and give me the big sad eyes that just kills me. They each know that they are going to get a biscuit so it isn’t too bad for them. Harder on me. LOL Once I give them each their treat they go to their beds, Cooper, my bed and Chien, her bed. I tell them I love them and then exit out the door. Love my fur babies and wish they could be with me always but mama’s gotta work so they can have biscuits. Our “leaving” routine is similar to yours. Buster sleeps in his crate and after he has had his breakfast and has been following us around while we get ready for work, we move his crate from the bedroom up against his doggie door and then he knows that we are leaving. We make sure his water dish is full, grab a treat (we are no long buying treats that are not natural) and we have to pick him up and place him in his crate as he will not go in by himself and then give him the treat. He usually goes through the doggie door and we say goodbye outside through the gate. That is our daily “leaving” routine. We would love to try these treats from Jones Natural Treats. Man, there is no way I could allow Chester and Gretel to be outside while we are gone. They would annoy the whole neighborhood by barking and squirrels (and just wind) all day. Buster is one lucky pup. My boy could star in the dachshund adaptation of Rainman so everything is a routine. We have one for leaving when he’s going along and one for when he’s staying. When he’s coming, I get a plastic bag (of the grocery variety) and put in whatever food and treats are going along. The mere jiggling of the bag brings him from wherever he is to wait anxiously by the door. The downside is that I can never touch a plastic bag for any other purpose. The upside is that he is ready and waiting when I am. When I am leaving and he’s staying at home, I put on my shoes, grab my purse and keys, and get everything ready for me to walk out the door. I say “go to bed” and he runs over to and jumps on his bed. I pet him, tell him he’s a good boy, and give him a small treat (usually a baby carrot, a blueberry, a nibble of cheese, or a piece of biscuit) and head out. He’s happy for the treat and not anxious about my leaving. That’s great that he is not anxious when you leave. Chester used to anxiety pee on the carpet even if I walked out to the car for 2 minutes…hence the crate. We started with crate training, moved to crate with open door, and eventually moved from crate to bed because he earned his way out and I was tired of tripping over the crate. I was lucky to have had him from a very young age and for the first 6 months I am pretty sure he thought his middle name was “leave it.” In (almost) 6 years, he has never chewed a single thing and has had only one accident in the house which I believe to be related to fireworks. (My neighborhood thinks July 4th is a 24×7 celebration lasting from Memorial Day through Labor Day). Full disclosure: He is very laid back; lazy really and not the inquisitive type. Also, he is never left alone at home for more than 2 hours. If I am going to be gone longer, grammy takes care of him or he goes to daycare. Fun that you get to take your pup to work. Our routine is much simpler when Chester and Gretel get to go with us…which is pretty often. It still takes a “process” though. Leaving is the worst! Although, I think it might be harder for me than it is for Frankie! She starts to get excited when she sees me packing up my purse, and then she starts spinning in circles when I head into the kitchen. Our routine involves pieces of dry dog food wrapped in strips of t-shirt that I then stuff into a Hole-ee Roller. She LOVES the challenge and it keeps her from inhaling the food! I too must bribe and sneak my way out! I stuff a ball with small training treats (they fall out as it rolls) and sometimes stuff some extra yummy soft cookies in a Betty if I will be gone a while. I get all my stuff ready to go. Then we go outside; when we come in, the radio goes on, Winston goes right to his bed, and I toss the ball, then run out the door! My dogs always eat in their kennels so they just need told what they are going to eat and they run for it…whether it’s a baby carrot, a Blue Buffalo cookie split among the three of them or a Blue Buffalo jerky split the same way…I like the sound of the natural treats especially for the health benefits. I have two who are 12 and one who is 7. I rarely feed Chester and Gretel anything that is not natural now. On rare occasions they do get a bit of cheeseburger meat or something. I mean, I guess that is natural…unless we are eating at McDonalds and then who knows what it is made of. Ha, ha. We might need to adjust our routine…fuzzy fur kid typically goes with us. 2 bigger fur kids are usually outside. Female doxie sits at the baby gate watching us leave, and is at the outside gate when we return. Our girls are so lazy I think they look forward to us leaving so they can nap in peace. We let them out for one last potty and then they snuggle up in their blankets on the couch and sleep the day away. On the weekends they look annoyed that we are interrupting their routine. Oh, yes. I forgot the potty in our routine. That happens before we start gathering our stuff. If we get ready to go and THEN let them out they won’t go potty. They want back in right away for fear of us leaving them (which is happening – they know). “free range” treats. I love it. We make Honey work for her treats. When we leave, I hide treats around the house for her to find. I can’t leave Chester and Gretel out when we leave but I’ve tried hiding treats around the house for them while I am home. I haven’t figured out hiding them in an easy enough place that they don’t get left to rot and a hard enough place that they don’t go right to them. I’ve had fun with small dog visitors hiding treats under the dining room table. It takes some effort to move around all the chair legs to find things but isn’t so hard that they get frustrated. My two girls don’t like when we leave, but often times will go along with the routine. First I make sure I am all ready to go, socks, shoes, whatever else. They usually start dancing around when they see me putting socks and shoes on. I will let them outside to do their business while I am finishing getting ready. During this time I make sure their crate has enough water in it. On warmer days I’ll throw an ice cube or two in it. When I’m all ready, I tell them “go in” and point at the crate and they go in. Sometimes Scooby doesn’t want me to leave so she will run into the other room and try to hide on the couch. When I get to her she rolls belly up so she thinks I won’t grab her. If it’s a short trip out, I won’t give them a treat. If it’s a longer one, they get either something small or split a treat. Bedtime routine is essentially the same. We will say “go to bed” and they go in their crate. They always get a bedtime treat. We have both girls in one crate. We got a secondhand crate for free that could probably fit a small lab comfortably. Given that our girls are littermates, they greatly dislike being apart from each other. So one crate helps keep the anxiety down during the day while we are gone. We also leave elk antlers and a couple chew toys in the crate with them to keep them occupied. What good girls to go into the crate when asked. Chester and Gretel aren’t “crate trained” beyond running in when they see the treats so we always have to use that method. That’s why I try to make sure that we give them low-calorie treats – sometimes they need two “in your crate” treats a day. They have separate crates but they are bigger than “recommended”. A 30-pound dog could probably fit into each crate. When we travel and they stay with friends they go into one big crate together. Ruby is really a good girl. I make sure her blanket is on the chaise so that she can watch out on the deck, turn on the radio.. (I don’t know if she cares about the radio but the noise makes me feel that someone is home). I give her a jerky that of some kind. I like the wellness liver treats but she wolf’s those down, so I try for something more substantial. She trots off to her bed with the treat, and I leave. Ruby does not rush the door or try to go with me unless I get her leash. We can go treat less when I leave, but in the morning she whines until she gets it. I wonder sometimes if she is pushing me out the door just to get a chewie. I can’t let Chester and Gretel look out the window even when we are home. They bark at EVERYTHING on the street. They do sometimes perch on the arm of the couch though and can see outside a little. We loved having Ruby stay. She is such a sweetie! Our leaving routine is pretty simple. I am cautious about treats and where they are made as well so I just use a few pieces of their dog food as a treat. As soon as Charlie and Gracie see me grab my purse they make a run for “their room” and leap into their crates. We have an extra room where they stay when we are gone and sleep at night. I leave the door to the room open but it is gated so there are no shenanigans in the rest of the house while we are gone. I took the doors off the crates since the room is gated but they seem to like staying in the crate anyway. I often find them together in the same crate. They each get 3-4 little pieces of their dog food before I close the gate head out the door. Would love to try a different treat for a change that won’t fatten them up and is healthy. Oh, I am very cautious about where their treats are made and from what. I am also super concerned about calories. I hold the harness & leash and they all come running. I have 3 and always in need of treats!! Our dachshund, Heidi, just knows when we’re leaving the house. She sees my purse and runs to the door. we get a treat or a rubber bone with peanut butter on it, throw it in the living room and run out the door. This is or course, after you make sure we have everything and have gone to the bathroom because if we go back in the house she will try to escape thru the open door. And since they are little dogs that is so easy. Of course this does not prevent her from jumping on the love seat in the bedroom and looking out the window at us. One nice thing about Chester and Gretel is that they never rush the door and try to escape. If I go near the door they look at me like “Are we going to get to go”? We also crate our little guy when we leave. He also has anxiety and has tried to dig his way out of the house. Replacing torn up carpet did not please Dad. We bring Cordon out and about with us a lot so as soon as I grab my keys he meets us at the door ready to go. If he is staying home I simply scoop him up and carry him to his kennel. As soon as Spartacus sees us putting on our shoes he runs for his crate turns around and sticks his head head waiting for his treat. Once we’ve shut the bathroom door and are ready to leave we give him a treat. He has the run of the house, but once he discovers the bathroom is off limits he goes to bed. His crate door is never closed, he comes and goes as he pleases but always goes in when we are leaving, long enough to get his treat. He’s very good. Lucky us. He likes the bathroom? The garbage? The toilet paper? The cool floor? He loves to take the used tissues out of the waste basket and shred them just ever so slightly and then spread them around the bathroom floor. Silly old dog. He will be 10 on 8/11. I’m mystified how he does this with never knocking over the waste basket and it’s never full, maybe two or three tissues at the bottom. Little Houdini’s aren’t they!! Dobbby and Baxter have free range of the house. And I don’t have to worry about them being naughty ( unless I leave something that us plastic out) . When I leave I turn on the radio and give them a dried duck treat. If I don’t give them a treat and leave I can hear them howling all the way down the walkway. That’s the same at our house…no treat equals howling. The treat, literally, takes Chester about 1 minute to get through so I don’t quite get why it makes such a difference. I give Teddy sweet potatoes and tell him to be good before going out the door. He used to not eat anything and drool all over himself… but he’s finally relaxed enough to eat treats! But I’m going to have to test natural chew! See how he likes these! And we don’t crate Teddy anymore because he seems more relaxed left out to roam around and rubs his nose raw till it bleeds on the crate door 🙁 He doesn’t have accidents in the house but he does bring in all of our shoes into the living room. Doesn’t chew on them, but just drags them all into the middle of the room.. not sure why but since he’s not destroying them, we’re ok with leaving him out. So my check before leaving the house is to make sure there’s nothing he can eat or hurt himself with 🙂 We used to feed Ted lamb lungs because he loved them, but that was before we found out he was allergic to lamb and lost all of his chest hair 🙁 They’re finally growing back after we cut off all lamb. oops! So he can’t have this treat but I just wanted to share. Allergic to lamb? That’s not very common is it? I thought that chicken was a big one. I have a friend whose dog is allergic to most meat sources. She has to feed him “novel meats” like kangaroo. Glad the Amazon link helped you find/order the treats. Feel free to message me any time you have a question. Leaving the house is always an extensive routine for us. We crate all of our fosters so after they all go potty and they get a treat in their crate. My Italian Greyhound doesn’t crate well when I’m gone so he hangs out in the living room. I pull the blinds all the way up so he can look out the window safely. I make sure the pantry and all doors are shut and make sure paper to ducts are put away. He loves to shred napkins and cardboard. By then he knows we’re leaving and comes to give me hugs and kisses (hoping I will stay) 🙂 sometimes he gets a kong with a special treat in it and then I tuck him in with lots of blankets. 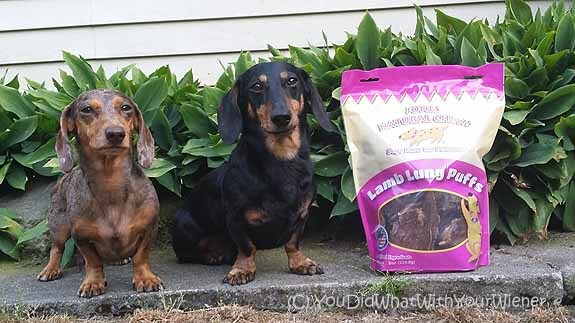 They would love lamb lung puffs. Thank you for doing a giveaway! I really wish I could leave Chester and Gretel out. Sometimes we have given them a chance to prove themselves but it always burns us so we have to stick with the crate. i just tell them to go upstairs. Toss cookes up the stairs and shut the door. They like when i leave but like more when i come home. Hi furriends! We don’t have a leaving routine, but our Mommy does have “head count” before she leaves. Every single time. MOL! Pee Ess – we’ve been voting for you! We put Pierre in his crate whenever we leave. Bentley stays out to roam the house, but he usually goes to his bed to sleep. Jones treats would be the ideal thing to keep them occupied. My husband and I are lucky that Fitz doesn’t typically show any separation anxiety. We just make sure to take him out for a potty before we go. We also make sure the baby gates are up so that he stays in the living room (mostly for our sanity so we dont have to worry if he suddenly decided to act like a punk and get into things he shouldn’t). He is happy to curl up in his blanket and sleep on the couch the whole time we are gone. Most of the time he doesn’t even jump down from the couch when he hears us come back! Luckily, the dogs are pretty good about me leaving the house- they have to shoot me puppy dog eyes and then dirty looks of course, but not too much anxiety. Wager is the more difficult one. If he at all thinks that you’re trying to catch him for any reason (even if he’s begging to be picked up/go out/etc, the minute you reach for him he runs and hides under the table, the silly puppy). However, once he’s finally caught, I always cradle him on his back and give him a belly rub, he gives me a few kisses on the nose, then we walk to his crate. I set him down in front of it, and he walks right in with no fuss, lays down, and gives me a look that clearly says “Ok, I’m settled, you can leave now- you’re interrupting my beauty sleep!” I select one of his bones or toys to place in the crate with him, and say “Goodbye Little Wager” and he’s all set. Quite a fuss for a dog that clearly enjoys his crate. He’s only 6 months old and not at all trustworthy loose in the house yet, so I’m glad he likes the crate. Shiloh is 4 and completely trustworthy, so he has the run of the house. He’s the one that gives the puppy dog eyes for a few seconds, then the hurt “I can’t believe you’re not taking me with you” look. But he follows me to the kitchen where I give him a small treat, then he wanders on his own to find somewhere comfortable to lie down. He watches me till I get to the door where I call “Bye Shiloh Boy” softly, and only then will he stretch out and go to sleep. It’s usually at this point that I remember everything I’ve forgotten to grab on my way out and have to go retrieve them. But with our routine done, the dogs don’t stir or try to follow me at this point. Such good puppies =) LyricInTime2803 (at) yahoo (dot) com. Oh, the days of hiding. Chester used to always hide under the bed…right in the middle where you can’t reach him from either side. He liked to take extra time hiding when I was late for work! Little Stinker. Ha, ha. I am so glad he complies with treats now. Similar routine with my two doxies. Mine get “Get Naked” treat sticks. They love them. I come home at lunch too….and sometimes they want me to leave so they can get their chew treats. Mine have a portion of the home that is for them to be in while I am gone. Usually they are pretty good. If the dogs are going I just say, “lets go” if they have to stay I just say “crate” and they go to their crates. They get a treat for going to their crates, and there are toys too. Our routine is pretty much the same as yours, except we leave the t.v. on instead of the radio, for our cutie, named Jasper! My route just before going out the door is……I first hide treats around the house while Schooner and Skipper are outside going potty. It is like a treasure hunt for them and it keeps them busy. I give Schooner and Skipper kisses and hugs and they give me kisses back. Then I get them a treats and say Mommy is going to work be good boys and watch the house for mommy! Chester and Gretel wouldn’t budge out the door if they knew I would be getting treats out. They learn routines really quickly so they would pick that up right away and make me give them treats BEFORE they went out…defeating the purpose. Wow, lots of people have already commented. We leave our three either in the Kitchen (my wife) or in the house (me) when we leave. Once we get them inside, since the back door is usually open to the yard, we say “get in”, and they hop in their beds waiting for a treat. Treat depends on what we have that day, but usually a small piece of dried chicken or a training treat. Even a piece of two of kibble words just fine. Each gets his or her own, and retreats for the 4 seconds it takes to consume it. By then, I’m out the back door. We have never used crates with them, and perhaps should have, but they do quite well either in the kitchen, or with the house to wander. No chewed items, and they are house trained at this point. Hi Bruce. That’s great that the dogs do well just roaming the house. I don’t think it’s necessary for every dog to be crate trained. It does come in handy in some cases but I did it mostly to deal with anxiety…which it sounds like yours don’t have. My “leaving” routine involves the dogs who are crated running to their crates for their treats, then giving the one left out in the house her treat last. There is a system that works with my five dogs! Well my leaving routine really isn’t much compared to some. Shiloh, my oldest, has somewhat mellowed with his age of 11 years so he pretty much gets the run of the house – AS LONG AS I MAKE SURE THERE IS NO FOOD WITHIN HIS REACHING DISTANCE since he will sniff it out. My youngest at 7+ years is my “perpetuall puppy” and so I feel a bit more relaxed when I leave – she is in a crate – I am fortunate with her in that she has learned my morning routine and knows what to do. The minute she sees me with a few small treats in my hand, she will run to get into her crate after which I lay the treats down at her feet. Shiloh gets a couple too – I like to toss them around so he has to sniff them out. After this, I head off to work. That is SO weird…that link is to one of MY posts. Ha, ha. Have you ever taken your pups on a boat or paddleboard? Oh gosh, if we had a pool in our back yard (lucky you by the way) I would be SO paranoid about them falling in. I don’t think I could let them outside because I don’t trust myself to ALWAYS remember to lock the gate. Our routine is real easy. Mom just says I will be right back, she goes to each of us and gives us a kiss and a pet and then she leaves. We all have our spots where we hang out to wait until she returns. No treats or anything while she is gone as she doesn’t want any fighting. That is nice. Obviously you guys are not anxious doggies. When Mom is ready to leave she says the word, “Going.” I hop onto the big chair and give my paw. She kisses my head (and sometimes leaves a lipstick spot). Then I get a MilkBone, which I eat quickly – usually in time to watch her through the window looking pathetic. That’s cute. You are such a good doggy! When our first dog was a puppy we would leave her in her crate and come back to check on her every 15 minutes because she had terrible separation anxiety. We gradually increased the time during the next few months until she stopped crying every single time we left. Her anxiety improved only after we got our second puppy. Now we just give them a treat and leave without much fuss. I love reading all the funny routines! I like to mix it up. Sometimes I like to blow their minds and just say bye and shoot out the door. Lol.